The Zetec is a European and North American made distributorless Dual Overhead Cam( DOHC) two liter inline four cylinder engine developed by Ford Motors and Cosworth Ltd. of the UK. The 2.0L Zetec was used in the Ford Focus, and as such has reached production levels that no other option has (for instance more zetec engines were produced than the entirety of all engines and displacements that Subaru produced from the 15 years 90-2005). The Focus is a "world car" and is sold in every market that Ford is present in, making it easy for the Focus to become one of the best selling cars in the world (it outsold the VW Golf in 2001 making it the best selling car on the planet that year, 64% of those were zetecs). The Zetec is extremely well designed and well made. We were surprised many times along the way by small, and not-so-small design features that help make the Zetec such a wonderful little engine. 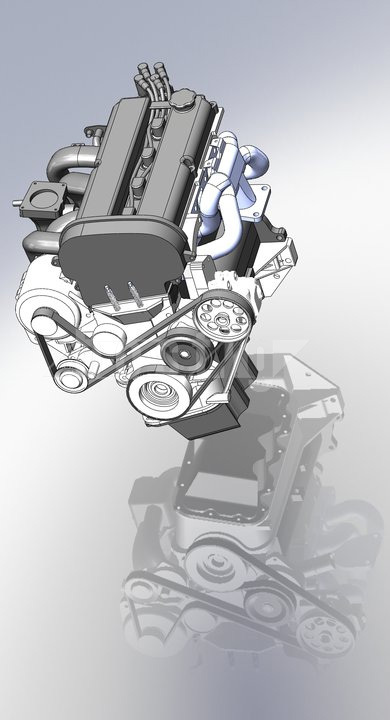 Its split case to help reduce NVH , its Non-interference design, and its mechanical simplicity are a few features that make the Zetec a rugged engine and tenacious performer. There are very few inline 4 engines that are as simple and trouble free as the zetec, and no horizontally opposed engines that are.